where 20 bloggers are making over one room in six weeks. I’m redoing our guest room. 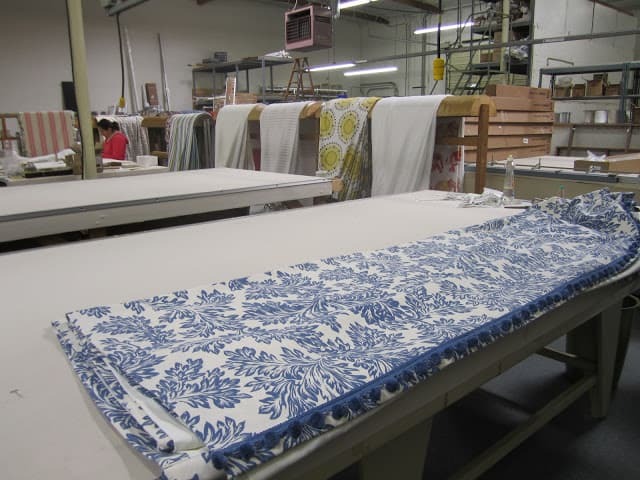 The blue and white leafy cotton fabric is from Dorell Discount Fabrics. It was only $10/yard and the ball trim was only $3/yard. When I need a lot of fabric, I make it a point to check discount places first. Here are the newly made curtains in the spotless workshop. 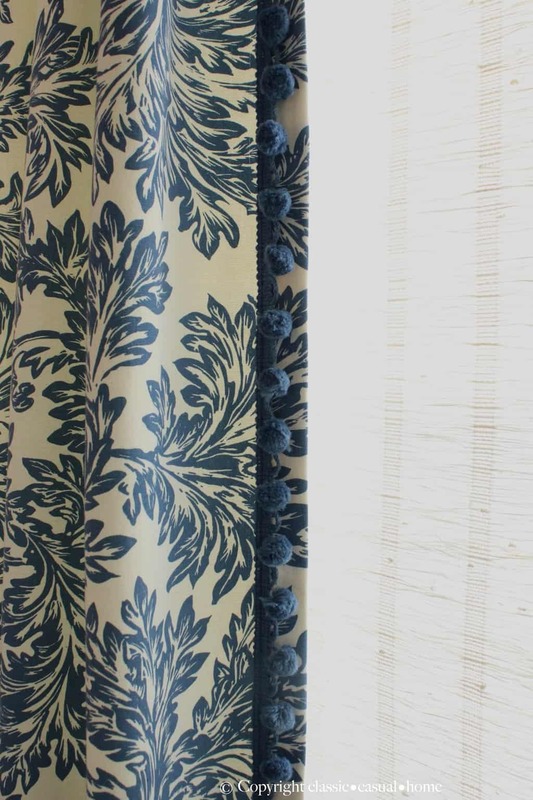 Locally, you can visit their store Creative Window Designs for help with the design and installation curtains. My representative, Barbara, is hiding from the camera. I had showed her a photo of the two pleat design (that they call “Soldier Pleats”) and they copied it beautifully. Their drapes have nice linings and weights. 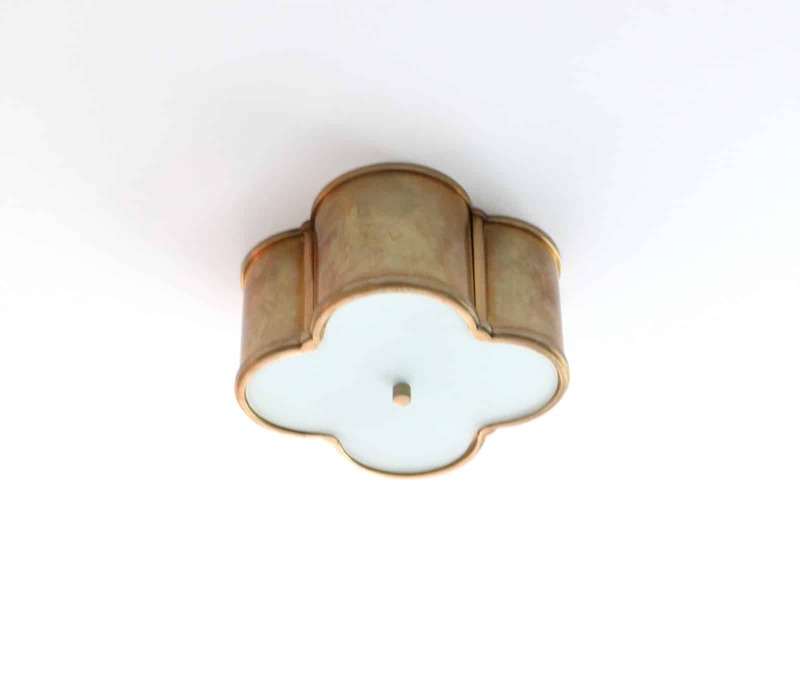 I love this light fixture from Circa Lighting. (which may be discontinued in the brass finish…I’m not sure why). 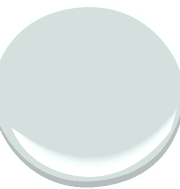 The ceiling is painted Benjamin Moore Glass Slipper. The walls are painted Benjamin Moore White Dove. The new lampshades provide a brighter look. (I can’t show you the outcome, it ruins the mystique of my stencil paint job). are a bit smaller and fit better on the small tables. This week, I want to paint a mirror that I already have and do some wall accessorizing…please come back! (and I am excited about bed linens in the works). Beautiful curtains!! And with the stencil wall, so good!!! 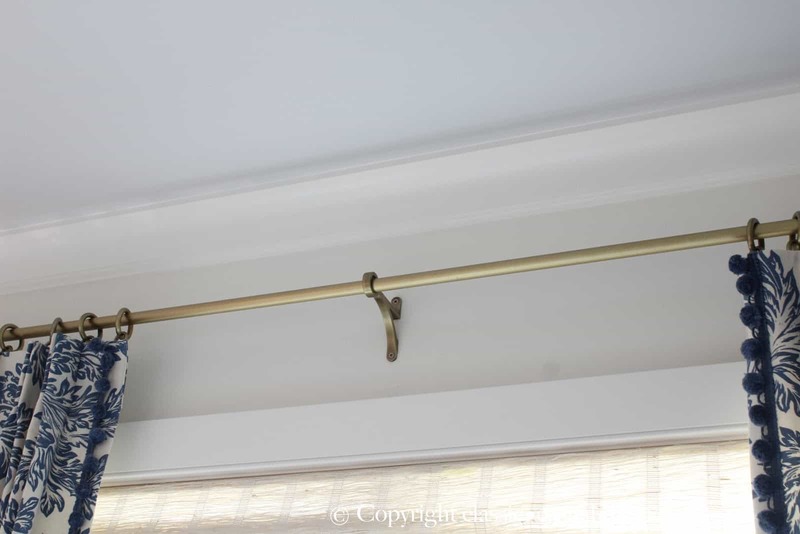 Pottery Barn needs to get back on the brass train…if they have discontinued those curtain rods (which I too think they have) they need to bring them back…stat! 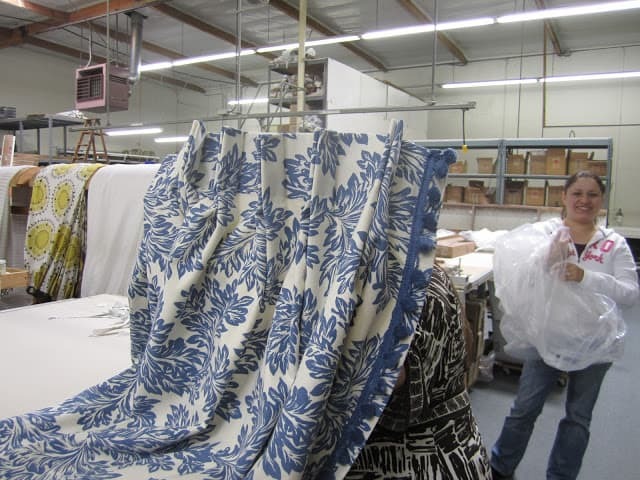 Love that fabric (can't believe the awesome price) and the pinch pleats….room is looking gooood! Custom curtains always get me. I just love how crisp they look. Lovely fabric on them. I think Sherry is having the same light fixture in her room. Great minds!I wish I could see the gloppy mess of a shade, it would make me feel better about my mess. I LOVE that fabric! The room is looking beautiful already! Looking so good. I love the blue and white and those are gorgeous curtains. Huge fan of the brass. This room looks ready for Ralph Lauren! I love it. I love the blue and white – this is gorgeous! WOW! This room is already beautiful! 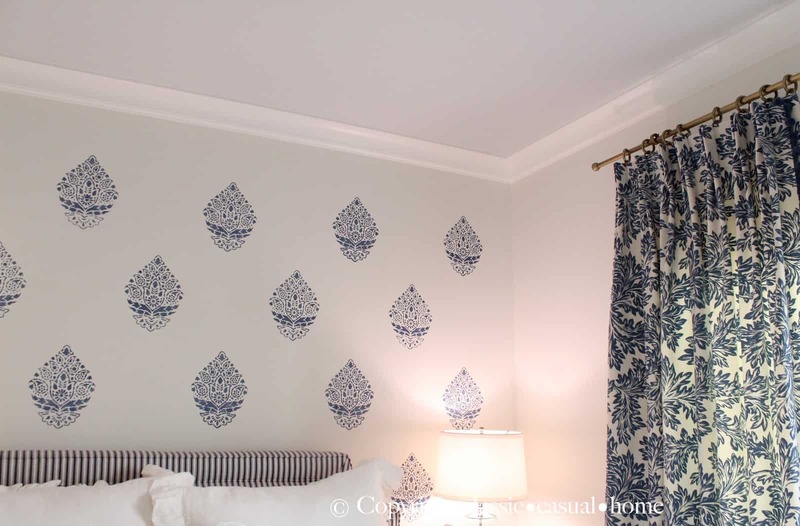 I love the curtains, the hardware, the lamps, the stenciled wall — it's ALL just gorgeous! The curtains are spectacular, love those soldier pleats and the pompom trim. The brass adds a nice warm touch to all of the cool colors, looking lovely! Such a beautiful room. I love the stenciled wall. Your curtains are gorgeous. I love the pleats and the trim. I purchased curtains with a similar pattern from IKEA not too long ago. I really like the colors you're using in the room. More….more….I'm dying to see more!! Wow, you don't waste any time girl! I love your beautiful drapes with the fringe trim, they're perfect with the stenciled wall. And the Circa light fixture is gorgeous. Yay….brass is back!! I can't wait to see the final reveal. Love the drapes and pom pom details. Also, loving the brass rods. Looking forward to see the finishing touches from this beautiful room! Your room is so classic and beautiful. Each week it gets better and better. Love that sewing workroom – they did a super job on the curtains! I love the curtains!! The stenciled walls look fabulous. 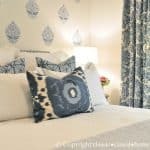 Your room is going to look amazing! Love that fabric and trim!!! 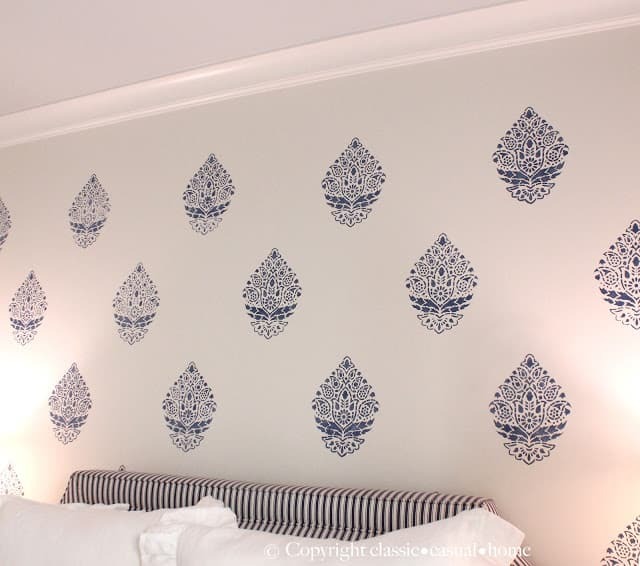 Perf with the stenciled wall!! Looks fabulous!! I absolutely love the trim on the draperies!! And the ceiling color is beautiful. You are doing such an amazing room! You have a magical touch. I love everything you do. Your heart and soul are always revealed in your decor. 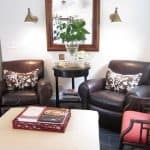 Anyone can copy a room, or hire someone to make a room pretty, but you make a room FEEL right. I know I would come out wearing a smile and having a song in my heart….. a better person….. after being in any one of your rooms for any length of time. Sounds sappy, but it's true. You truly inspire me. Thank you! whoa…is that the best compliment…ever? I do not deserve it. so so so pretty. You are totally making me fall in love with blue and white! I don't know which detail I love the best so far. It's looking great! Gorgeous! Gorgeous!! Gorgeous!!! I love how the stenciled wall turned out 🙂 Thanks for sharing ALL your sources, Mary Ann. You are a class act. Holy Smokes….you are kicking it! This bedroom is going to be beautiful. I am still crazy in love with the stencil. 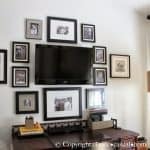 Mary Ann, I absolutely adore what you are doing with this space. 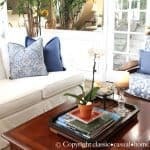 Blue and white has always been a favorite color palette of mine and yet I haven't used it in my own home. You are giving me great inspiration! 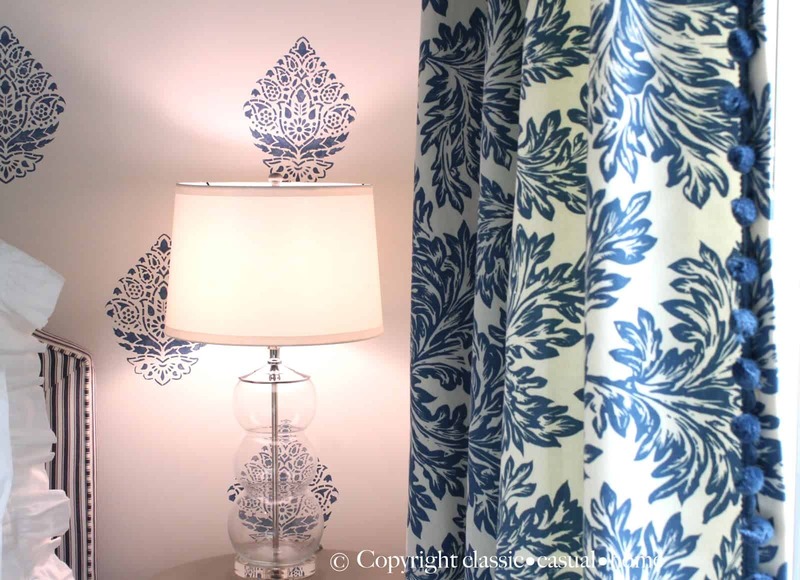 love the new curtains – they coordinate so well with the stenciled wall. You have so many pretty touches – the brass curtain rod, the brass light, the painted ceiling. Love it all! Those drapes are gorgeous! And I thought the wall was wallpapered (somehow I missed your post last week! ), it is looking so amazing! Great job so far Mary Ann – I love it all, especially the ceiling color. Very subtle, great addition! M.
Your guest room is looking so lovely Mary Ann. Love your drapes and the pleats and those lamps from RH are perfect. I can't wait to see the whole room at once. I appoint you the queen of the one room challenge because this guest room is looking outrageous. Love the blue and white, a beautiful tribute to your talent, imagination, good taste and ingenuity! Bravo…cannot wait to see the big reveal! Love, love, love the drapery fabric! Just gorgeous! Oh my goodness the curtains are stellar! Love the brass too – looks amazing with the blue & white!! Perfection! The headboard, the stencil, the drapes, you are really nailing it. I love that stencil, may have to get it for a tone on tone in my dining room. This is really looking great. I love the way the stenciled wall and the curtains turned out. Love, love, love it! Everything looks so inviting like a costal hotel room only better because you've hit your mark of excellence here. Thanks for sharing the how-to's and sources. Really well done. Ali's room or the new guest room looks absolutely gorgeous! I still can't believe you stenciled that entire wall. That is one of those projects that I would think I could manage…but then probably would never finish. It really does make a dramatic impact. Love the lamps, draperies, ceiling fixture…can't wait to see how you accessorize the room! love, love the palette Mary Ann! Indigo + white is so refreshing! 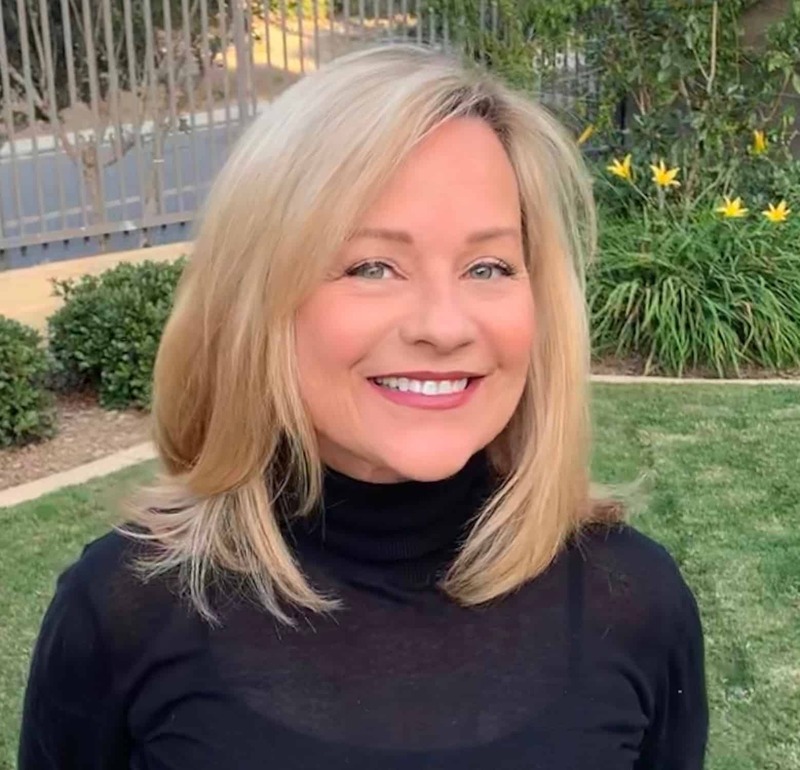 Mary Ann….looks fabulous. Love where you spent your money. The ceiling light is fabulous! Everything is coming together! I love it all! I think we are all in love with the Circa light! You are making great progress – jealous :). The room is really looking great! I love using Dorell as well. It's a must anytime I need to find inexpensive fabric for a client..or me! How fun!! I love this room and how it's turning out! My style all the way!! Gorgeous blue and white…….love the room. long time reader – first time commenter!! Just love how this is turning out!!! The stencils are to die for! I just did some stenciling on coasters, and wanted to rush! It is not easy work, I tell you! You've done a marvelous job with that room! It's coming along beautifully!!! 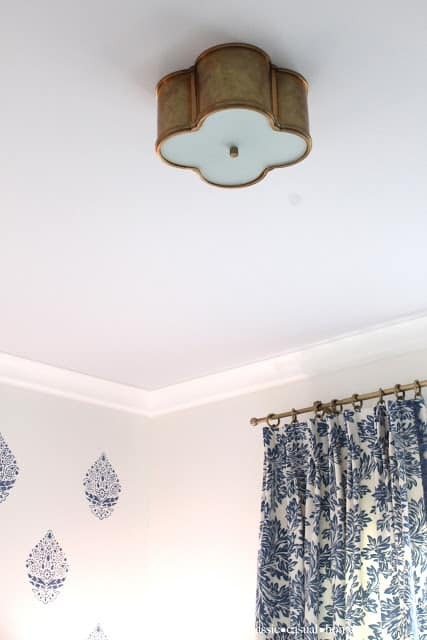 Loving the light fixture and brass hardware. Oh and the ceiling is such a nice little touch. love the wall stencil! looking good, girl! Thank you for the lovely inspiration. I just featured your post on my design blog! Nice post,Thanks for sharing.It is very beautiful home. I just came across your blog and this room is stunning. I am wanting to get some curtains made and was wondering how many yards of fabric did you need to make the curtains in this room?